In Indiana, Joe Hamer is an internal affairs investigator with the Lake County Sheriff’s Department. He’s also a K-9 handler. But “Sheriff Bruno” is no ordinary K-9. “He is a one-in-a-million dog,” Hamer said. 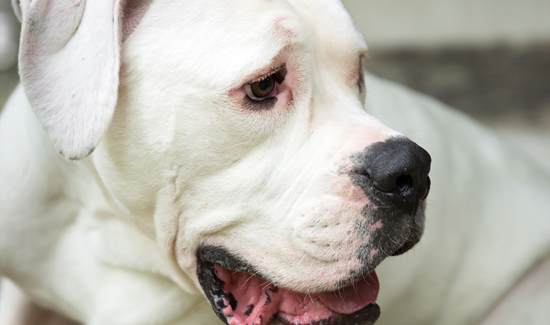 Above: That’s not Sheriff Bruno, just a similar looking white American bulldog. Hamer and Bruno are leaving the sheriff’s department this week to start working with the National Concerns of Police Survivors Office in Camdenton, Missouri. Hamer and Bruno’s new gig will be comforting and supporting families of officers killed in the line of duty. According to a post from My Santonio: Bruno’s first line of duty death was when Howard County Sheriff’s Department Deputy Carl Koontz died in March last year, Hamer said. “(Bruno) was going to people when they were crying. When they were emotional, he was pulling to go towards them,” Hamer said. This year, they attended services for Allen County Sheriff’s Department Sgt. Joseph Cox in February and for Southport Police Department Lt. Aaron Allan in July.